The Sunday was spent in Mumbai for the opening of a showroom of Senco-Gold as I am the brand ambassador of the company. It was a great time with miss universe Sushmita Sen who was also invited there and is a very good friend of mine. The team of Senco Gold was present there and they received us with warmth and love. Apart from being a very beautiful lady, Sushmita Sen is a good human being also. The whole day was spent there and we spent a lot of time in talking to each other. We had a lot of fun and cherished old memories. The hospitality we received, was very special and really needs to be highlighted. The showroom is undoubtedly very attractive. The Collection of jewellery in the showroom is also going to be very different and unique. Senco-Gold is one of the most renowned names in Kolkata and in Bengal. Surely the newly opened showroom is going to be liked by the people of Mumbai very much. I am hoping to meet the team again very soon. Love you, take care and God bless. Finally our shooting of Tumi Je Amar came to an end and it was a fantastic experience all over. The last day episode will be telecast on 3rd August, Sunday. It is worthy of a program to be showed on a Sunday evening and I hope many families are waiting to watch it and going to keep their eye on television set. It was a grand event when we completed our shoot it took the whole day effort from us. It is obvious that the telecast will also produce a grand effect. This mega episode concept, though not new nowadays, is not going to be the same as what you see usually in a grand episode. People in a large number were present there. The set was different and we all were in a kind of grand a festive mood. It was a musical evening and we saw a great performance by Usha di. When an experienced and versatile singer like Usha di makes a presence on a stage, none can go beyond the spell of her music. Not only Usha di was present there, but we also had three big names of our industry, who played roles of heroine with me in different times. Satabdi Roy and Indrani Haldar were there along with Rachana Banerjee . All of them contributed equally with the whole team to make it a success. I am quite sure that people have not seen for a long time these extremely talented people together in a single show on television. I hope they will like it and will be eager for that Sunday to come. Love you, take care. God bless. Today is the final day of Tumi Je Amar shoot. After a long run of success, we have come to an end. I really enjoyed working with the entire team. During these days, I came to a closer contact with different people. It is absolutely an unforgettable experience. Shooting for a television program makes your everyday different. When we started it we hardly knew all those people who came and enriched our show. Now, when we are on the last day and when I look back I only take lots of memories, spent with the entire team. The dedication what the team showed throughout, is absolutely incomparable and worthy of praise. I really feel that I am going to miss all of you guys. 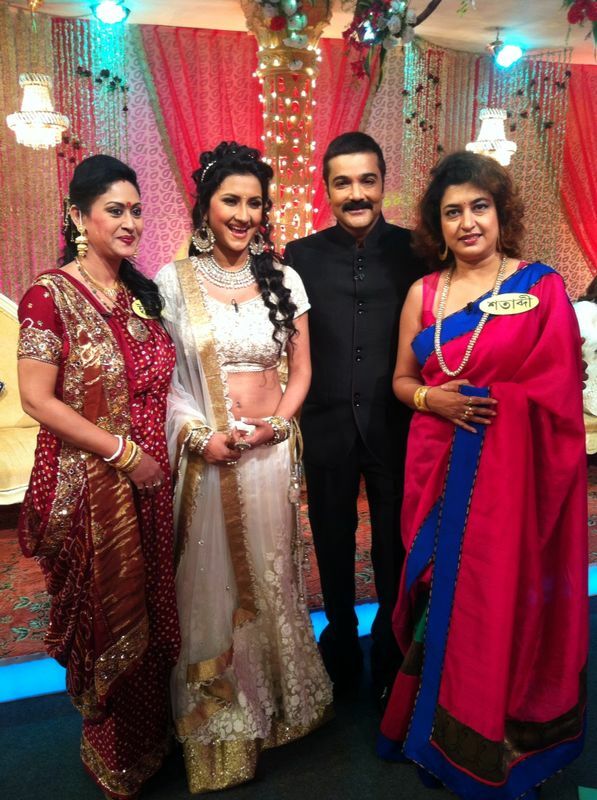 I thank ZEE BANGLA also for such a wonderful show. I have received lots of love from my fans during my career, but in the set of Tumi Je Amar I Also got a chance to know more about people and to have a lot of fun with them. Though I am going to spend a busy schedule for the next few days but this grand occasion of the last day shoot is surely always going to remind me all those beautiful days that I am going to miss. Love you, take care and God bless. Shooting of song is complete that we are going to have in our upcoming movie “Force”. Shooting of a song is always different. After the shoot of action scenes throughout these days, song shooting was really something refreshing. Music adds a special flavor in a movie irrespective of Bengali or Hindi. And an action packed family drama is also incomplete if the music is not up to the mark. Music not only focuses on the songs that you see while watching a movie, but, it includes to a large extent the background music also. An action packed movie requires a greater effort in background music. The director has to be always conscious of the sounds of his surroundings and of different moves of an action sequence. And only through this alertness a better effect in sound is produced. Making of the music of FORCE was a challenge to everyone of this team. It deals not with the romantic subject matter and the music also because of this fact, has to be different in kind. Our music director has done a wonderful job and it is perfectly stitched with the main plot of the cinema. I hope you all will like it on the big screen very soon. Love you, take care and God bless. Books have so far been the best companion of my life. I started my career as an actor and people since then have been watching me in movies. But movie is not the only place where I Appear. I have a library of enormous amount of books. Books of different kinds are there. I spend a lot of time in my library apart from going to gym. Yes, it becomes very tough to manage time when I am in a particular schedule of shooting. But I don’t let time to surpass always over my personal longing. When a script is based on a novel or any text, it is obvious that an actor has to read it. But reading for an actor should be an act to go beyond the limitation of his imagination. ‘Reading’ can be ‘soaring’ if the mind is not preoccupied with reluctance. There must be the hunger for the knowledge for each and every man belonging to different professions. Reading can only enrich a mind and seeks no compromise from your side. An idea is valuable only when it is shared by a mind. If a mind only generates ideas and keeps it without using it as a resource, it cannot serve for anyone. Human beings are several of kind and their shared experience incurs idea for another person. 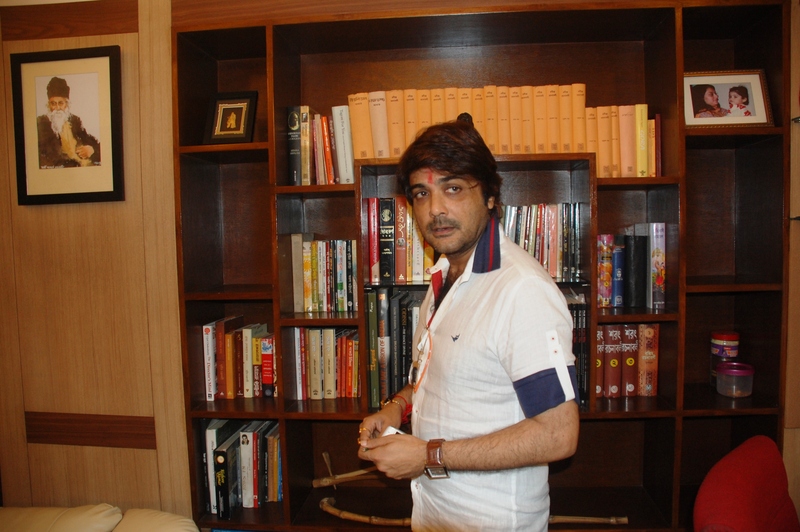 I am an actor who is equally indulged in reading different books. I begin to read without thinking too much because I keep on thinking while reading. This act of reading gives me scope to think. This is the time that I rarely get to be with my books and I hardly will let it go away without reading. It is a nice day to have my unfinished work completed and to attend meetings for my upcoming movie. New and challenging roles to play on screen have always attracted me. An actor should always be fresh mentally as well as physically. Otherwise the mind hardly gets prepared to accept a challenge which seeks physical and mental dedication. For me gym is the ideal place to announce the beginning of a day. This is the place where my mental set up gets prepared to go to a field of action. I am always keen to go to gym at least even for an hour in a day. I already have mentioned earlier that my mood to a large extent depends on whether I have been there or not. Close friends and my family can easily make out whether I have been to gym or not in a particular day just by observing my behaviour. It happens in a strange way unintended. Sometimes, even I get shocked to be judged by them so accurately. We had a great evening today as it is the birth day of our director Raja Chanda of the movie, FORCE. The entire team was present to wish him a prosperous and happy birth day. We all wish him a very successful and happy life. He had cut the cake for us and gifted a moment that we can cherish. The child actor Arjo, of the film, was present along with his father. We also had Raja’s son with him who was absolutely happy on his father’s birth day. My son was also there to participate in the birthday celebration. The special day has brought smile for us. The evening could not have been much better than this. I am thankful to all the members of our team for this wonderful evening and wish my director-friend a very happy birthday. After a long time I am in my office again. So much stress I had during these days to complete the climax shoot of “FORCE” which ended yesterday night. It was a hectic schedule and apart from the stress I enjoyed a lot to shoot those fight scenes after so many days. And now it is time for meetings. Several meetings are to be held up, from which new ideas are going to be generated. I am really excited for this new schedule I am going to have for some more days. I will be able to spend a lot of time in gym now. My family and my friends say that whenever I am not in good mood, it is merely because I have not been able to manage time for gym. This little time occurs very rare and surely I am going to utilize it as much as possible. Hardly can time be managed after a complete shoot of the film as these post shoot activities seek a lot more time before the release of the film. Love you. Take care and God bless. At last we are on the final day of the shoot. The talkie parts of the movie are now over. We Had an action shoot yesterday. The rainy evening brought our mood in perfect harmony with the weather. Today our fight scene shooting is going to end and thus it will lead to the completion of the climax shoot. We have right now two songs left for shooting. Major part of my time will be spent now in editing. The dubbing of the film will be started shortly. We had a wonderful time while shooting for these days. Special thanks must be given to the whole team which never failed to support even for a single moment. We would also like to thank Essel Vission for being there with us throughout. The artists have done a great job and every time one has surpassed another in excellence. The experience is so fascinating that I will love to work again with the entire team, whenever is possible. I am really excited about the film and hope you all are not going to fail to watch a film like this.Love you all and take care. God Bless. Today is the second day of the exciting climax shoot of my much awaited upcoming movie “FORCE”. The director and the entire team are working hard throughout the days. As it is an action-based movie, the Fight master is doing an exceptional job .I am sure that you all will like and appreciate the team effort as I am back again with an action film after Bikram Singha. The subject and the story of this film is completely different from the former one. Bikram Singha was a complete commercial action package, whereas “FORCE” is a movie that despite being action-packed ,is ultimately a family drama .I am working with Arpita after 12 years which is really a special addition to this film .It will be unjust if we forget the effort of the child actor Arjo Dasgupta in this movie, who has done exceptionally well in the role of a special child,and a son .Director Raja Chanda is one, with whom it is my first film .It has been our plan for a long time to work together, and our collaborative effort has made us execute the plan.